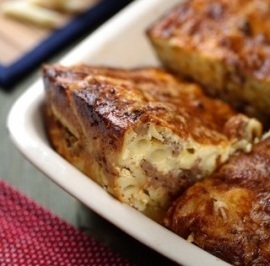 The “formal” name for this breakfast casserole is a cheese strata recipe. It is called a “strata” because you layer the ingredients, then pour on the egg custard mixture. Trim crusts from bread and spread the slices with softened butter. Cut each slice of bread into 4 strips. Butter a 2-quart casserole and make alternate layers of bread strips and grated cheese, ending with cheese. Beat eggs. Add seasonings and milk. Pour over bread and cheese layers and refrigerate for at least 24 hours, covered. Take out of the refrigerator for an hour or so before baking so that it comes to room temperature. Bake for 40-50 minutes or until puffed and brown. Sprinkle with paprika and chopped parsley as a garnish if desired. 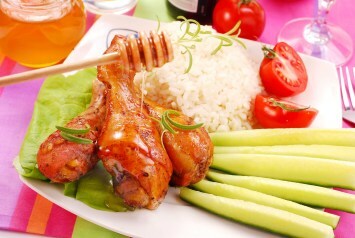 The casserole can be prepared ahead and kept in the refrigerator for a few days before baking. Add chopped cooked bacon, fried mushrooms, chopped red and green pepper or broccoli pieces add variety and nutrition. This type of casserole is always prepared ahead, then refrigerated overnight before baking the next morning. That gives the luscious custard time to sink into the bread. When you bake it the next day, the whole thing bakes up into a light and custardy cheese and egg mixture. A cheese and egg strata is a wonderful breakfast or brunch recipe and perfect for times when you have overnight guests, such as the holidays. There are many variations on the breakfast strata recipe idea. See them with our other brunch and breakfast recipes here.